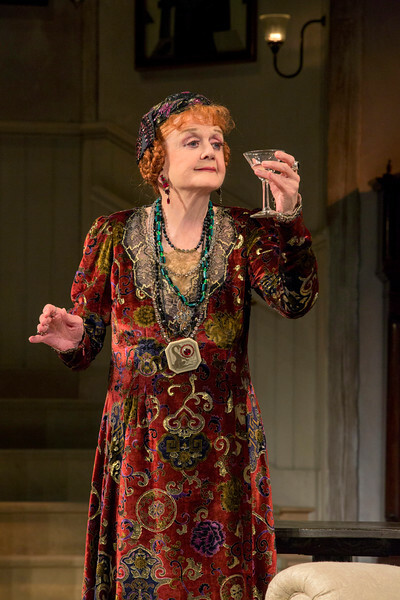 Earlier this week, I attended Opening Night of Noël Coward’s Blithe Spirit at the Ahmanson Theatre starring Oscar and five-time Tony Award winner Angela Lansbury in the leading role as the quirky and charismatic Madame Arcati. This smash-hit comedy arrives in Los Angeles following its acclaimed and sold-out engagements on Broadway and London’s West End. The comedy begins when Charles Condomine (played by Charles Edwards of Downton Abbey) announces that he is doing research for character ideas for his new novel and decides to invite the eccentric medium Madame Arcati to his house for a séance. While consumed in a trance, Madame Arcati unwittingly summons the ghost of Charles’ dead wife Elvira. Appearing only to Charles, Elvira soon makes a play to reclaim her husband, much to the chagrin of Charles’ new wife Ruth. Needless to say, comedic antics ensue with Angela Lansbury at the center of it all and she is delightfully funny, energetic, affable and vibrant at age 90 in this memorable role. She is so fun to watch and just makes you smile throughout the whole play. Blithe Spirit is a fun, entertaining, laugh-out-loud comedy that leaves you feeling good and elevated. It’s the perfect show to see this holiday season if you want to lift your spirits (literally 😉 ), have fun and most importantly see a Broadway Legend in action. I took my bestie Stacy Cox to the show, we laughed, we marveled at the buoyancy of Angela Lansbury and we thoroughly enjoyed this spirited journey of humor and wit. Blithe Spirit will be at the Ahmanson Theatre at the Music Center in Downtown Los Angeles now thru January 18th, 2015. Ticket prices start at $25 and you can find all the details HERE. Disclosure: The CTGLA invited me to Opening Night of Blithe Spirit for editorial review, however all opinions and giggles are my own. I have always liked Angela Lansbury ever since she was on Murder She Wrote which was so many years ago as well as in Bedknobs and Broomsticks.